From Nov 1995 until August 1998, i lived in Hyde Park, which is on the south side of Chicago, near The University of Chicago. 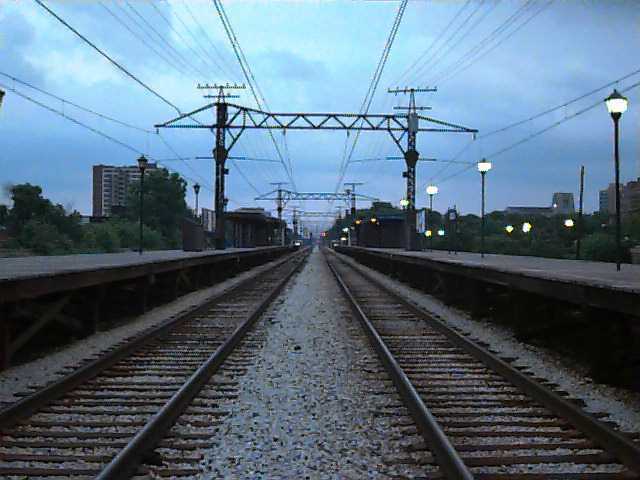 This is a picture of the train tracks at the Metra train stop where i used to board and de-board the train, coming to and from work. It's an electric train, as you might have noticed. When i don't ride La Metra to work, i usually ride my bike up the Lakeshore bike path. 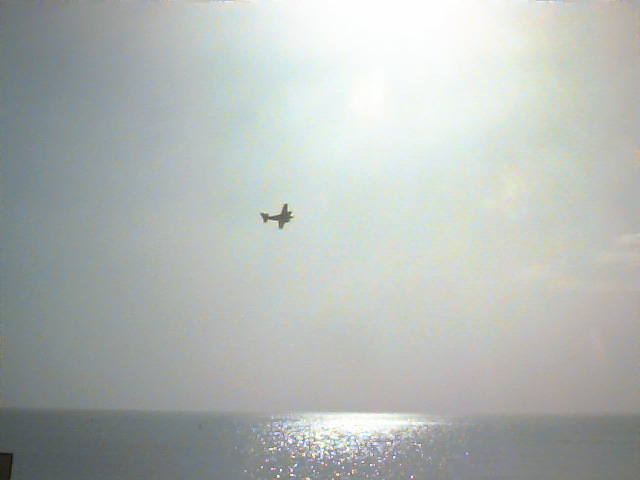 I've gotten some nice pictures along the ride, like this plane that just took off from Meigs field (given a new, but finite (5 years) lease on life earlier this year) in the morning sun rising over Lake Michigan, or what certainly appears to be a U.S. military C-130, "Flying Hercules" This particular Herk was taking off from Meigs field about the same time that President Clinton & Veep Gore were campaigning in Chicago during the 1996 elections, which leads me to believe Herk was carting around Secret Service cars and stuff like that. 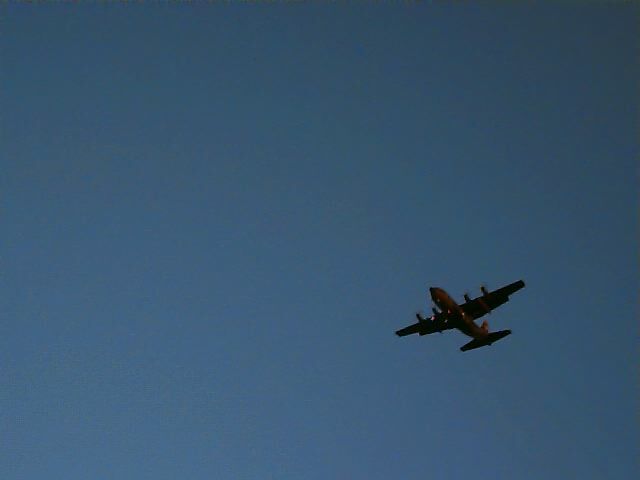 Not all the cool sights from the along the Lake are of airplanes. 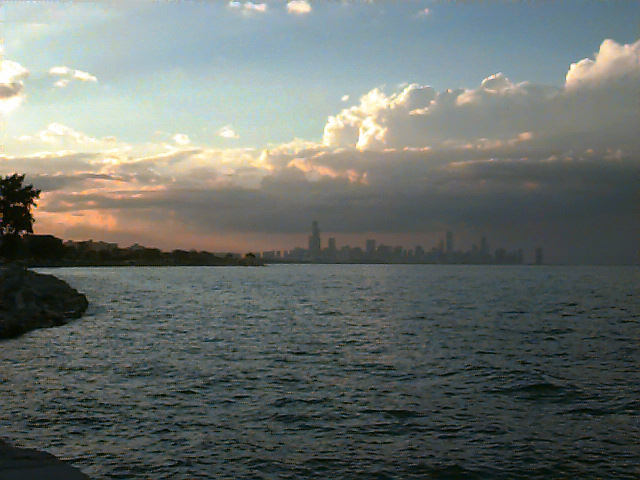 This is not an entirely unpleasant shot of downtown Chicago (usually referred to as "Tha Loop" by locals) taken from the Lake front. 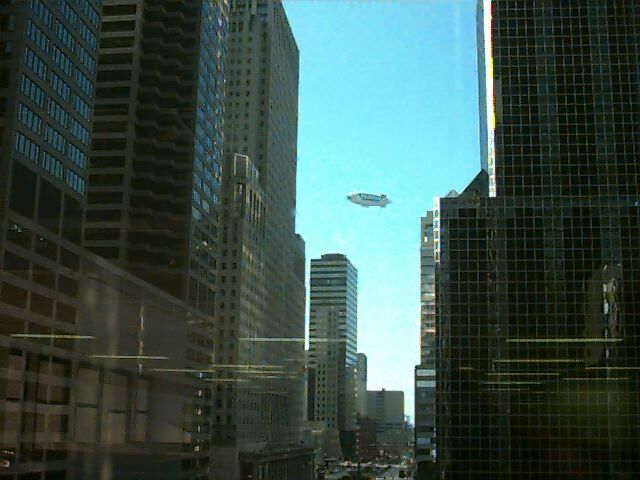 From inside the Loop, one can still see many different aircraft, like this Jet Ranger or this Fuji blimp. Chicago, particularly the Loop, is known for its architecture. 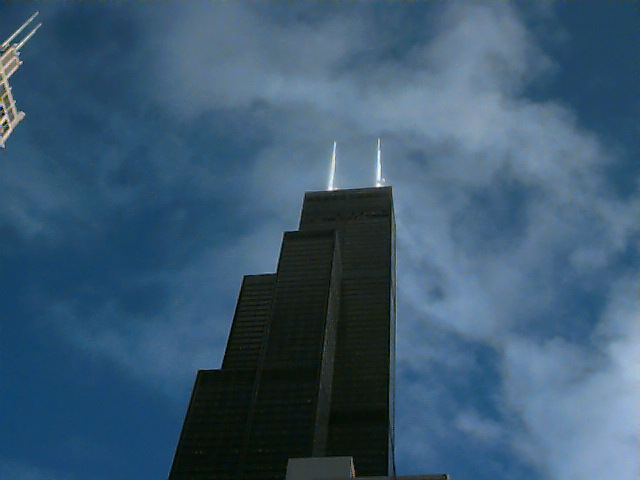 These are a couple of pictures of the Sears Tower. 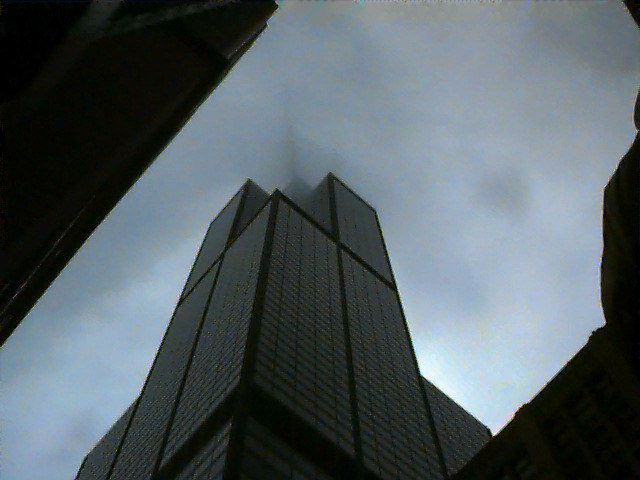 If you look carefully at the first , you can see the shadows of the Sear Tower's booms in the clouds. 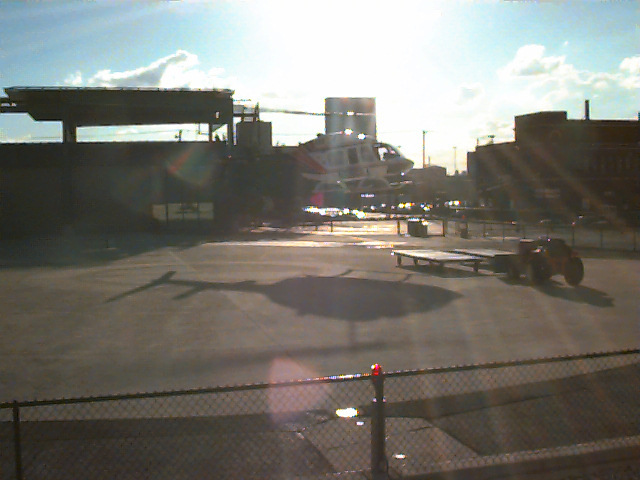 This second picture is of some low clouds being blown southwards across the same booms of the Tower. 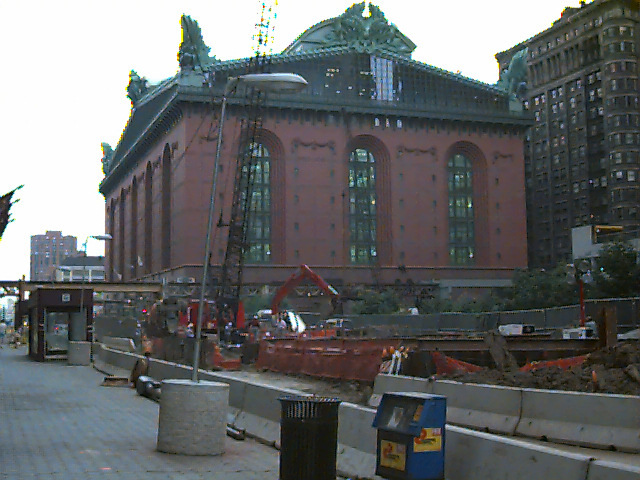 A relatively recent addition to the Loop is the Public Library at the corner of State & Van Buren. If you find yourself with a free day in the Loop, you should go and see the stuff in the Art Institute. It's a truly world-class museum with more cool things to look at than you would be able to see in a week. This is a picture of one of the two lions out front of the Institute. Rumor has it that each May Day, if someone creeps up to the lion on the left side of the entrance and whispers "Marx likes Coffee," into his ear, the lion will come to life and spend the rest of the day hunting down and eating some of the many capitalist-types that are integral to the Loop's dominant financial sector. 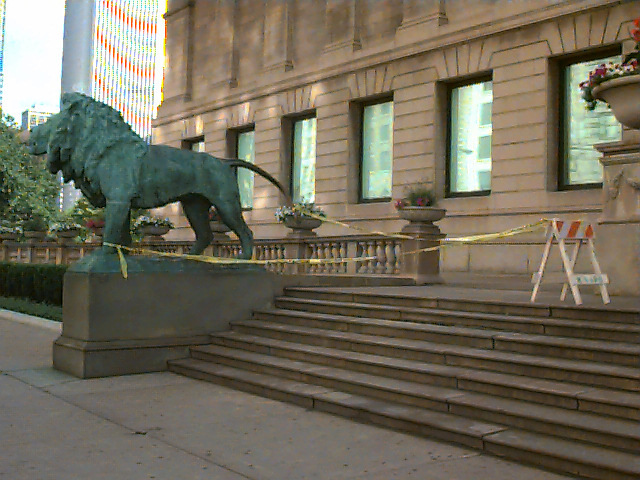 One can only assume that due to the rather significant financial liability incurred by this annual event, the Museum has begun restraining this Lion with yellow "Police Line -- Do Not Cross" tape, (as shown in my picture) which the lion does not seem to be able to escape. Oh well. If you don't go to see the Art Institute with that free day, then you really should be seeing the stuff in the Field Museum or the Museum of Science & Industry. 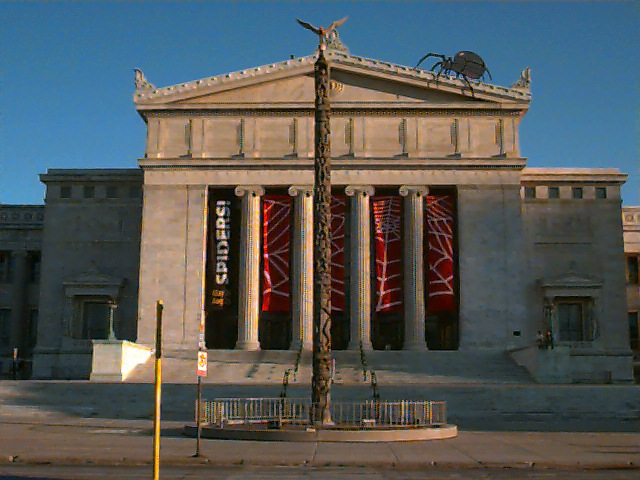 This is a picture of the North entrance to the Field Museum. 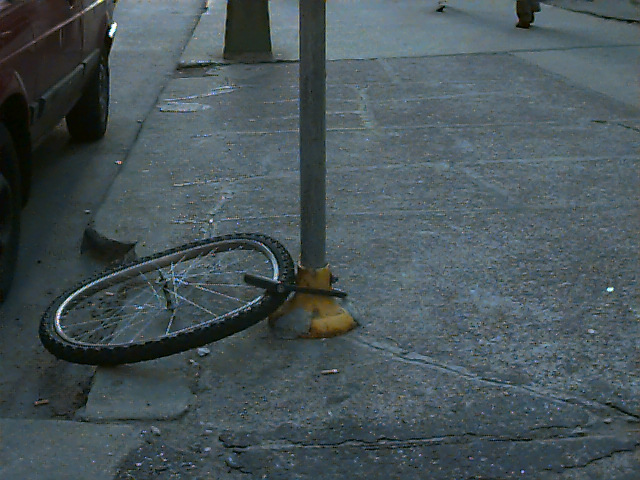 This picture , also taken in the Loop (i think round abouts Monroe & Franklin) kind of stands on its own. A kind of polar opposite to the man-made rock, metal & glass mountains and valleys of Chicago's Loop is a cool geological phenomenon & place to visit called Enchanted Rock, near Fredricksburg, Texas. This is a picture of the hillock itself. 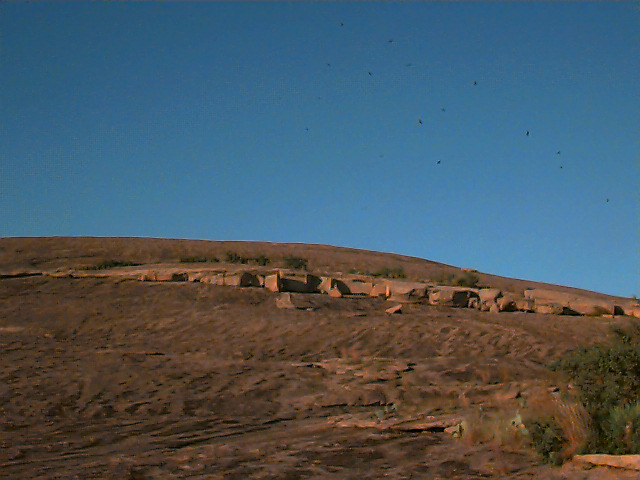 You can see some of the many buzzards that hang out at Enchanted Rock, cruising around on the awesome winds running over the rocks. More pictures from the Texas hill country, these are both taken from Mt. Bonnel in my old home (Sept. 1986 to Nov. 1995), Austin, TX. 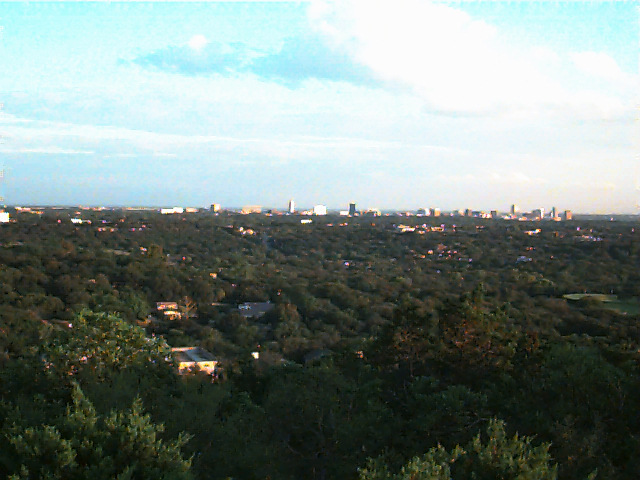 This first one is the view south-eastward, of the Downtown-State Capitol-University Campus-part of the Austin. 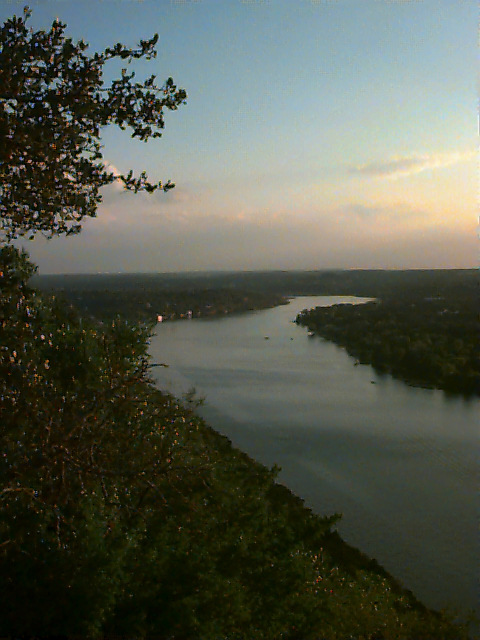 This second picture is southwestward, of the Colorado River (no, not the one that Southern California steals from Arizona, another one) and some really expensive (well, expensive for Austin) real estate. 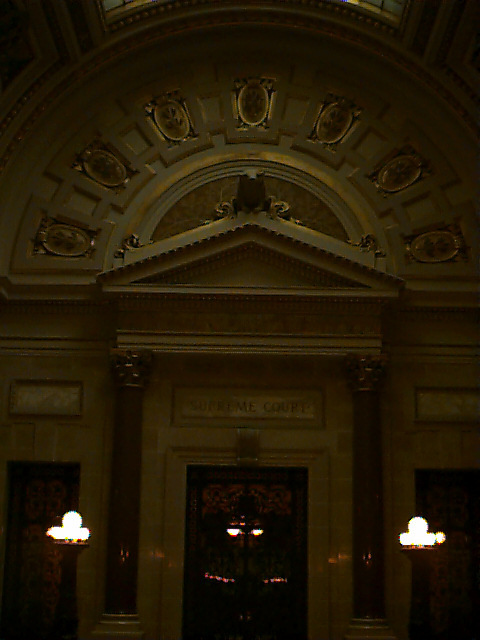 This last picture is of the State of Wisconsin's Supreme Court, inside the capitol building that resides in Madison, Wisconsin. I think i decided to put it here because of the cool badger on top of the arch over the door.